You might have heard the frightening statistic that disposable diapers are the third largest consumer item in landfills and make up about 4% of all solid waste. While most of us want to be as environmentally responsible as possible when it comes to diapers; the prospect of spending hours scraping poop and laundering cloth diapers can be daunting when you’re exhausted in your new role as a mom or dad. Luckily, gDiapers have come to the rescue! If you haven’t yet heard of gDiapers, they are the world’s first flushable, compostable diaper, pairing the “green” attributes of cloth diapers with the convenience of disposables. As a new mom of a five week old baby, gDiapers have been a godsend for my time-constrained eco-aspirations. They are cute, comfy and most importantly, easy to use, and I can’t recommend them more highly. Here’s how they work: Each gDiaper is composed of three elements: a cute washable outer cotton layer called the little G pant, a washable waterproof inner layer, and a flushable poop and peep absorbing insert (which sort of works like an old school maxi pad). The gDiaper starter kit comes with 2 little G pants (the cute colorful outer layer), 4 waterproof inner layers, and 16 flushable inserts. That’s fine for a start, but to really make this work you need about 6 little G pants, a bundle of waterproof layers, and boxes of the flushable inserts. When you change your baby’s diaper, you simply remove the flushable insert, toss it in your toilet, and replace it with a new insert. 1. When you toss the flushable insert into the toilet, you need to help break it up and dissolve it in your toilet with a little plastic stick that you swish around the toilet bowl. This may sound like a pain, but don’t be alarmed. Yes, this means that a gDiaper change takes about 1 minute longer than a disposable diaper change, but I find it sort of amazing and enthralling to watch how the insert dissolves so quickly in water (it’s made from tree cellulose). 2. While in theory you could just take out and replace the flushable pad at every diaper change, in reality it is much easier to change the WHOLE diaper kit-and-caboodle and deal with poopy inserts later. The best way to do this is to have at least 4 little G pants on hand at your changing table, locked, stocked and ready to go with their inserts in place. This way the diaper change becomes a 10 second affair, and the toilet bowl insert-swishing can happen later after your baby is happily changed and in another room. 3. The waterproof inner layer and the cotton outer layer do get wet and poopy on occasion, although not with most diaper changes. I’ve found it necessary to hand wash at least one plastic inner layer each day, and one little G pant every few days. Fortunately, the G pants can be thrown in the laundry and washed with the rest of your clothes, just like regular underwear. I’ve read a lot of online reviews about gDiapers, and I have been bummed to see that many parents don’t seem to stick with them because they don’t find them convenient enough. I think this might just be due to having overly high expectations about their convenience (perhaps trying to make the switch from using disposables, or from gDiapers own marketing messages), that just don’t line up with reality. The bottom line is that gDiapers are definitely less convenient than disposables, but the difference is not insurmountable. It is worth putting in the effort, given the positive impact using them makes on the environment. Yes, it probably takes 1 minute more of work for me at each diaper change to swish up the flushable insert in the toilet. However, when I consider that this action means I am not sending 15 nasty plastic disposable diapers to pile up in a landfill every day, taking the extra time is well worth it. Plus, the gDiapers are comfy for my baby and they look adorable on him. My baby Petey in his G Diapers! 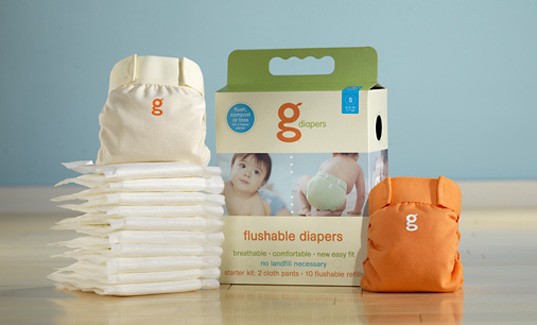 I highly encourage all new parents to give gDiapers a try – an honest, wholehearted try, for at least 2 weeks. I think after a few days of getting into the groove of swapping and swishing, you will agree that these things are an environmental godsend. don't forget - the peep diapers can be COMPOSTED! i've been using gdiapers exclusively for my son's entire 17mo life and they are great. our house is very very old and we have a septic tank that may or may not be able to cope with the gdiapers, but we compost all the pee ones and just (gasp!) toss the poo ones. the pee ones degrade in our compost more quickly than most of the vegetables! I tried to love these diapers for several months and in the end, realized they just aren't worth it. I went to cloth and that is WAY easier, cheaper & more effective. The g's look cute, but the cons really outweigh that single plus. They cost a lot, the inserts leaked pretty often despite being paranoid and checking them constantly (don't even think about using them at night because even two can't be reliable on a regular basis). Yeah it was nice to flush them, but despite always breaking them up, there were several close calls on backing up the toilet and you still have to wash the liners & pants every few days, so you might as well just use cloth. The biggest problem with them is the poop constantly gets smeared on the liner, which you're just supposed to "get used to". This is gross & not very hygienic to try to wash out in a sink at home let a lone out somewhere. The liners get stained immediately, so waiting to wash them isn't really an option either. A lot of work, $$ and sanity wasted. Save on all those and just go cloth if you want to help the environment. Costly.. hardly going to make any impact at all to the mass consumer of disposable diaper. Whether you use disposable, semi-disposable, or cloth diapers, if you want your baby to be dry, you need to change him/her often! Like my husband says, who likes sitting in their own poop for hours? Even if the diaper absorbs it all, baby still needs to get clean, and the poop and pee will still be there. True, gDiapers are not perfect, but they do the trick. My baby also gets blow outs ocassionally (esp if she goes without changing for a bit), but I prefer to wash just a bit of it out of the liner or pant, than a whole diaper full. I heard from other moms that it gets better as they get older (less diapers), so I might switch to cloth then as the pants are much better quality. I have heard the argument, though that you have big impact on the environment anyway, from the detergent and water wasted. What do you all think? As for this comment: "Costly.. hardly going to make any impact at all to the mass consumer of disposable diaper" ... I compared with disposable diapers, and they seem to come to about the same. Yes, one baby does not make a huge difference. But if we all said the same, then it would be 1,000 babies, and THAT would make a difference! I'd like to use them, but the inserts alone are almost twice the price of disposables (about 40�/diaper vs. 24�/diaper). Yes, yes, saving the planet is priceless, but these diapers are not. If they were even on average 30�/diaper I'd consider it. The argument that cloth diapers aren't as green as G diapers isn't so strong once you stop and think about the amount of resources used in making these flushable inserts on a regular basis. I use cloth diapers, I buy them once, they only use up resources once and if you have a high efficiency washing machine you are using less water than flushing down each one of those inserts! I have been using gdiapers for the past 10 months and love them. I compost the pee inserts and only flush the poopy ones. We also use the if its yellow let it mellow rule in the house, so really its not very often we need to flush. As the babes get older they poop less frequently and in a larger volume, but I have found the gdiapers do the trick. Even my dayhome provider has gotten into using them. I do a load once a week and don't have to scrap chunks of poo out of them like the cloth diapers (although I do use cloth inserts at least once or twice a day when I know there will be no pooping). My daughter has used them through the night since we started and sure, there have been a couple of nights when we had a leak, but I can't imagine that any other diaper has had 100% success either. I love the fact that people are arguing about gdiapers because it means that more people are thinking about not using traditional disposable diapers. As more people start using them, the demand goes up, production increases, cost decreases and our children thank us for putting less plastic in the landfills. How can I buy gDiapers on Italy? Only by e-bay site? "shipping costs" discourage me! Really not reseller in Italy? Anyone use Kushies? Unfortunately, I cant get G Diapers locally, but I've found Kushies. Any comment? I started with g-diapers when my son was born and was warned that using them with a baby under 8 lbs can result in a lot of leaks. I decided to wait until he hit the 8lb mark before I gave them a try because I didn't want to be discouraged right off the bat. Well he leaked at 8 lbs, 9 lbs and 10 lbs. I spoke with the very helpful staff at g-diapers and tried a few tricks but was never able to make them work. I am now trying the cloth all in one organic bum genius and the eco-swaddlebeez hoping for better luck. i have to admit, that after buying the g diapers, i realized how easy it was and have completely switched to cloth diapers! i LOVE it! 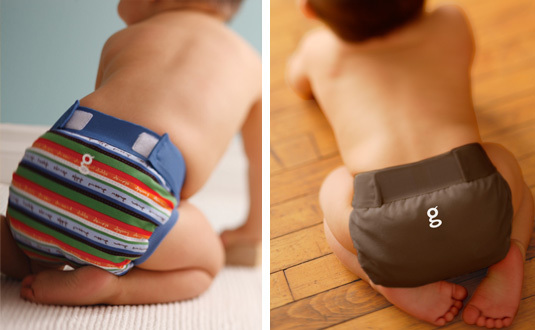 thanks for the inspiration g diapers! i use a combination of prefolds and covers, and all in ones and some pockets, they are all fun and i am so proud of myself for switching. I have found that the gDiaper fits easily into the Bumkins waterproof cover. The cover can be rinsed by hand and dries in minutes so it is ready to be used again with the disposable diaper. Even if you toss all the inserts away, they still break down much faster than the plastic diapers do in landfills. (What was it? Like 500 years for the plastic to break down vs. 60 days for the G's?) And if you look at the energy needed to heat the water in a washing machine, as well as the water used to wash the cloth diapers, add extra energy used if you dry the cloth diapers in your dryer instead of line drying them... The G's still come out to be the better alternative when it come to being *green*. As far as blow-out are concerned... A couple are bound to happen to everyone, no matter which diapering option you end up choosing... Seriously though, part of being a good parent/ caretaker is making sure that the baby does not sit in soiled diapers any longer than needed. Tried these for months earlier this year and got fed up, went cloth and never looked back. Cloth is just easier, more reliable and cheaper. It was too big a pain in so many ways trying to figure out the fit, breaking up the flushies, doubling up at night, trying to remove the stains on the liners and trying to deal with a poop smeared liner out and about was a nightmare. If you're really trying to save the environment, the amount of energy spent making the single use flushables majorly outweighs the energy involved in making a single reusable cloth diaper that can be used hundreds of times. I even tried the prefolds in the gDiapers, but it still wasn't consistently leakproof and involved as much washing as regular cloth. Nice in theory, but just not practical or really that green. Now that I've been using the G-Diapers for over 4 months I just want to weigh back in on this post and say that they are still working extremely well for me, and my baby is still using them. We've never had a 'blow-out', never had to 'double up at night' and I find the swishing of the diapers in the toilet slightly cathartic. The only issue I have had with them so far is taking them out to other people's homes where the plumbing might not be so up to par. I once embarrassingly caused a toilet clog at my friend's house when trying to put a G-diaper in her toilet, (a plumber had to be called) so now I only take my little tyke out in Seventh Gen disposables. But that is it. Otherwise they are perfect! I am a mother of a 1-month old. For the last 4 weeks we have been using cloth diapers in the gdiaper covers (plus the plastic liner) instead of using the disposable inserts. It has not been much extra work and has been a very cheap option compared to buying the gdiaper inserts, disposable diapers, or diaper service. It also has been great for the environment. We bought non-bleached cloth diapers and cut 4 inches off the end to make them fit the small size gdiapers (they might fit the medium or large size fine without cutting them). The ends should be stiched or they will begin to look frayed after a couple of washes. Just fold the cloth diaper by having the thick layer in the middle and the two sides folded on top of that. It should fit well into the plastic liner just like the gdiaper disposable inserts. There is no pining needed and you don't need to put the cloth diaper on the baby first. Just pre-load up a few gdiaper covers with cloth diaper inserts and diaper changes are as fast as disposables. When we change our baby, we dump the cloth part into a small tight-lid diaper pail or directly into the washing machine. We also use reuseable cloth wipes (we just have 4-5 at a time moisened with water in an old wipes container). The cloth diapers, cloth wipes, and the occational soiled gdiaper plastic liner or cover, all can be put into the diaper pail and washed together. We have found that with our breast-fed only baby, that we do not need to soak the diapers first (it might be different once we give our baby solid food). The normal wash (warm/cool water, 7th Generation soap, extra rinse) gets most stains out. There is no diaper smell in our house, but the downside is that we do a load of laundry once a day. We have a front-loading washing machine so water use is minimal. Also, our baby so far has never had a diaper rash. We use a little Bag Balm (in a green tin container and sold at the Target pharmacy or cosmetics aisle of Walgreens) each time we change our baby. It costs about $8 and lasts about 3 months. We like using the gdiapers as diaper covers instead of the other options out there because they don't seem to leak like other ones we tried, the removeable cloth diaper is easier to clean than most diaper covers, and we can use the gdiapers as they were intended to be with the disposable/flushable inserts when we leave the house or travel. I have been using gdiapers since my son was born over 7 months ago and we could not be happier. At first, due to reading some reviews, we used disposables at night time for fear that the gdiapers would leak. However, we eventually ran out of the disposables and I ended up putting a gdiaper on him for night time sleep and since then I have not looked back. The gdiapers actually work better than regular disposables! You have to get the fit when changing your baby, but I have had less leakage with gdiapers than disposables. Also, for those of you that are putting cloth diapers in the gdiapers for the sole reason that you feel that is better for the environment, think again. The energy used in washing and drying your cloth inserts, not to mention the chemicals involved, leaves more of a carbon footprint that a flush in a newer low flow toilet. If you don't believe me read 'Raising Baby Green'. Thanks for this post...I never considered cloth diapers, but your article, along w/ our night-time leaky diaper situation, is making me open to new ventures! Just wrote a quick post on my blog (www.doodlebuds.blogspot.com) about it...hope that's ok with you! Hi. I would really love to start using GDiapers. But I dont think I will be able to get them in South Africa, where I am. If anyone knows if they are available here, please let me know. Thanks!!! We received 15 g-diapers from the Miracle Diapers Network. They also send CLOTH inserts, not flushables, to be used with the covers. If anyone has any problem with the flushable inserts, just use cloth inserts instead (these can be bought in organic hemp or bamboo just about anywhere online). A BIG BONUS no one has mentioned is that cloth diapers (especially ALL IN ONE diapers that are waterproof, have a sewn in soaker, and do not require a cover) HOLD odors so much, despite how much you wash them, enzymes you use, soaking them, vinegar in the wash, detergent used, etc. At least with g-diapers (as with waterproof covers only), the odor doesn't stink up actual diaper, just the soaker - which is much easier cleaned and laundered than a sewn in AIO or pocket diaper where the urine and feces have to leach through a layer of fabric to get to the soaker in the first place. Just something else to consider. And you can use cloth for all the urine times of days, and a flushable for the 1-2x per day when they are expected to poop (ours is always first thing in the morning). Best of luck! We use G-diapers and love them. We use prefolds in them - just fold over the top to fit the length, then fold in thirds to fit the width and stuff -- especially good for boys who pee up front! Gdiapers also just came out with a gcloth insert - hemp and microfleece -- soo soft! And right now there is a great deal going on -- you can get a pack of 6 g-diapers (3 orange, 3 white) for only $40 using the code g721rogers at checkout -- they are normally $70. The flushies are great for night-time and when going out -- although it is just as easy to take a wet bag (or a big ziplock bag) to keep wet cloth inserts in. I also like that with the cloth, my older one can feel when he is wet to help him learn when to go - we are working on potty training. Hi! If anyone is interested in trying gDiapers (they now have cloth inserts as well as flushable refills) this is a great deal to get started! Everyday g�s six pack, 3 orange and 3 vanilla, now available for just $40. The price is usually $70, but until the end of the month, when you enter the code below, $30 comes off!!! Go to gDiapers.com and at check-out,Just enter in the coupon code g832Mulhern (case sensitive) and get a great deal! 6 gDiapers for only $40!! i have been using them for months, and I love them. They work just a well as disposables! I will be having my baby first baby in january. I want to use cloth diapers. I am on the fence about the gdiapers because of diaposible liner. I saw that they are now selling cloth inserts. Has anyone tried them yet? The thing that makes my little g's so awesome is that they have gcloth inserts as well. They are a hemp cotton blend and I adore them. I use them all the time at home, and switch to a flushable, or even a disposable when we go out. That way I can just toss the insert instead of bagging up a gross cloth to haul home. To me adding the inserts makes a convenient option for cloth as well. And I just toss my cloth in whenever I do regular laundry so it's no extra water used. As for staining if you wait too long, I keep a bucket full of water and some seventhgeneration non chlorine stain lifter to toss them in. I've been using them for a couple months and I have no stains. I recently started using gdiapers and wishing I would have switched over sooner. I use them with prefolds at home, I have yet to try them with the grefills. However, using them as cloth alone saves what would be going to disposables. They fit nicely on my 9 mo. olds chunky thighs, he looks super adorable in them, and I'm helping out the planet by not filling the landfill with plastic diapers while saving money. Diapers.com currently has the 2,6, & 8 packs on sale (wich are actually cheaper than buying them seperately), and if you enter the Code: MLX26222 you'll get the $10 off your first purchase PLUS $5 off your next purchse. What's great is they ship items in 1-2 days and orders over $49 ship free. We use g diapers with Green Mountain Diaper newborn prefolds for a completely cloth option that isn't as bulky and doesn't make as much laundry as the all in ones. We love it. We are also doing infant potty training so it's nice to have something that's cute and goes on and off quickly. Best of all. It's really cheap. We only need two g pants for our newborn because they almost never get wet or poopy (she used to have blowouts when we were using disposables all the time). The Green Mountain prefolds are only $2 each that's much cheaper than the hemp g inserts and they are much more absorbent. They can be ordered online at the Green Mountain Diaper website. I'm recommending these to everyone because I'm so happy to have found an easy cloth diapering option that doesn't have huge start up costs and doesn't require me to do laundry everyday. We do a load of diapers about once every three days. Hope this helps someone. i love my gdiapers. i never understand when people complain about the poo getting on the plastic liners...its so easy to rinse off that i cant imagine it being a problem :/ for those considering getting them my advice is: 1) order through the company as its less expensive and often free shipping 2) buy a clorox bleach pen and keep it by the sink, when theres poo on the liner rinse it off with a little brush (also kept by or under the sink) then rub the stain with the clorox pen, rinse, then its good as new. 3) dont dry them in a dryer. wash them in a machine (or hands) and hang dry them. it will keep them in perfect condition if you choose to resell them. also, when your child gets solid poo (instead of the runny newborn type poo) it almost never gets on the liners. 9/10 times it stays on the biodegradable pad. After much research on all the cloth/hybrid diapers on the market, my husband and I chose to go with gDiapers; cloth Inserts and the disposable liners. I find this combination suits our household and lifestyles very well! My husband was weary to try cloth, but when I showed him gdiapers he got excited! The disposable liner catches the poop, toss that away, cloth insert goes to the wash, sometimes the waterproof liner, sometimes the whole thing. Yes the cost is up there but you have to expect a bit of a cost to be green. I love all the colors, they make great gifts!! We love our gdiaper system! You might have heard the frightening statistic that disposable diapers are the third largest consumer item in landfills and make up about 4% of all solid waste. While most of us want to be as environmentally responsible as possible when it comes to diapers; the prospect of spending hours scraping poop and laundering cloth diapers can be daunting when you're exhausted in your new role as a mom or dad. Luckily, gDiapers have come to the rescue! If you haven't yet heard of gDiapers, they are the world's first flushable, compostable diaper, pairing the "green" attributes of cloth diapers with the convenience of disposables. As a new mom of a five week old baby, gDiapers have been a godsend for my time-constrained eco-aspirations. They are cute, comfy and most importantly, easy to use, and I can't recommend them more highly.